"Eat the cookie! EAT IT!" I found this photo while searching through my closet. It was taken in 1966, when I was a year old. We were visiting my Aunt Jean and Uncle Bill's house. Bill was my dad's older brother, and as far back as I can remember, whenever my dad was between assignments, we were visiting family. 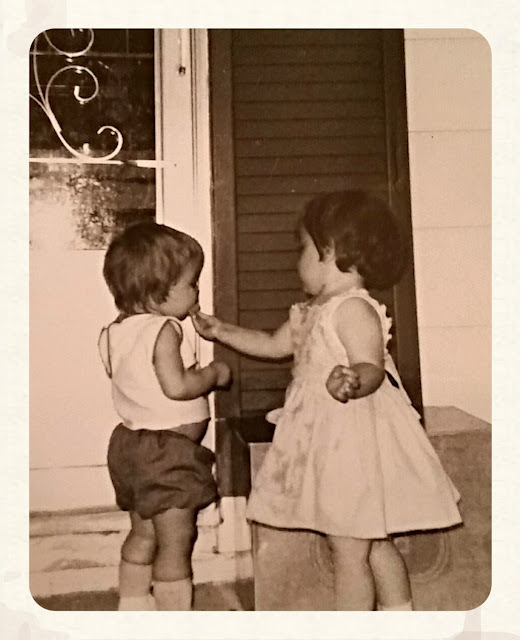 The little cutie in the dress is my cousin Theresa, and it appears that she is trying to shove something in my mouth. Or she could be attempting to steal my pacifier; you never know with toddlers. Theresa's six months older than me. There was a population explosion in the family in 1965; after me, came my cousin Dennis, and my cousin John. We ended up playing together at family get-togethers after that. As I was looking at this picture, it struck me that I have an odd relationship with food. I'm not even sure what that means from a psychological aspect, but people just seem to end up bringing me cookies, slipping me chocolate bars on the sly, buying me dinner, etc. They seem to know instinctively that I find comfort in those types of kindnesses. I'm not a huggy person. Emotions make me uncomfortable, particularly my own. I have trust issues. I'm just as likely to bite a hand as shake it, if I feel like things are getting touchy-feely, because I become defensive about my own emotions. Food offers me an opportunity to circumvent the weird side of my brain, the one that is suspicious of everyone and everything. It's like when you're trying to earn the trust of a dog or cat, and you offer them treats in order to build that trust, I suppose. Once I have food in hand, even if I never take a bite, I feel calmer. I have something to do with my hands instead of wringing them. I have something to look at if I get anxious about the eye contact. The plate in front of me becomes an extension of my personal space, an area that can be shared with someone else. It's really a win-win situation for all around. I think too much, don't I? This was just supposed to be a little trip down memory lane, and then I had to get all deep and introspective! What kind of relationship do you have with food? Go check out Mamakat's Writing Workshop for more fun writing prompts! I have always found comfort in food, too. Different reasons for me, but I do love it. Thanks for your honesty and willingness to share. If it were me in the picture (and it very well could be, as another child of the 60s), it would be my pacifier that some other kid was trying to yank out of my mouth. I love how you described yourself as not a huggy person, it made me laugh. I am so the opposite - I hug everyone and was thinking how funny it would if we met:). It's too easy to find yummy foods to make us feel better. That picture is darling! This is interesting! When Maile was a baby I had to curb myself from making her happy with food. Often when she would cry I would be like "No, it's okay baby...here do you want a cookie!?! We love cookies!!" My intention was always just to distract her, but I realized I was creating a weird association for her and I nipped it. I think it speaks volumes about my own relationship with food too!